Landsat images help track urban change, a factor that can impact a community's flood risk. The Federal Emergency Management Agency, or FEMA, uses these images to help identify where they should launch a new flood study. Flood studies determine how prone different neighborhoods are to floods of a certain intensity or likelihood. Successful flood studies require an arsenal of tools, however, including data on river flows and storm tides, hydrological and hydraulic analysis of landscape and river systems, and historic rain data, to name a few. These studies have adding satellite data from Landsat to the toolkit. With its archive of images capturing sprawling cities and new developments, Landsat helps FEMA track how building and construction is impacting an area's landscape. Earth-observing Landsat satellites have been capturing images of the planet's surface since 1972. 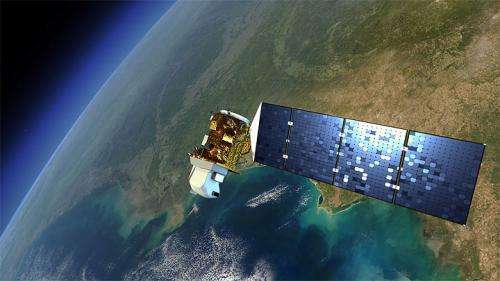 Landsat 8, the newest satellite in the joint NASA and U.S. Geological Survey program, was launched Feb. 11, 2013, and now collects more than 400 images per day. New and archived Landsat data are available free to the public from USGS. Researchers put the free data to a multitude of uses. One is called the National Urban Change Indicator, or NUCI, a product developed by MDA, a company that makes geo-spatial products derived from satellites. Using satellite imagery, NUCI detects if an area has undergone a human-induced change over a 25-year period. "If you identify areas where urban change is accelerating, there are consequences," said Zack Roehr, a senior spatial analyst with Dewberry, Fairfax, Va., a FEMA subcontractor. Urbanization can spell trouble for flood risk. Soil typically acts like a sponge, absorbing water from rainfall. When soil is covered with concrete or other impermeable material, water has nowhere to flow except towards storms and rivers, thereby increasing flood risk. "The ground is no longer able to hold water, which means local flooding sources are going to receive more of that water," Roehr said. "The flooding characteristics are going to change."